AIPMT-NEET Biology Aspirants, read out the next AIPMT-NEET Biology Study material/ Notes of Chromosomal Disorders in Human, important for AIPMT-NEET Biology. Free online notes for AIPMT-NEET. Hey All AIPMT Biology Aspirants, read out the next AIPMT Biology Study material/ Notes of Incomplete Dominance in Genetics, useful for AIPMT Biology. Cross of F1 dominant offspring with its homozygous recessive parent is called a Test cross. 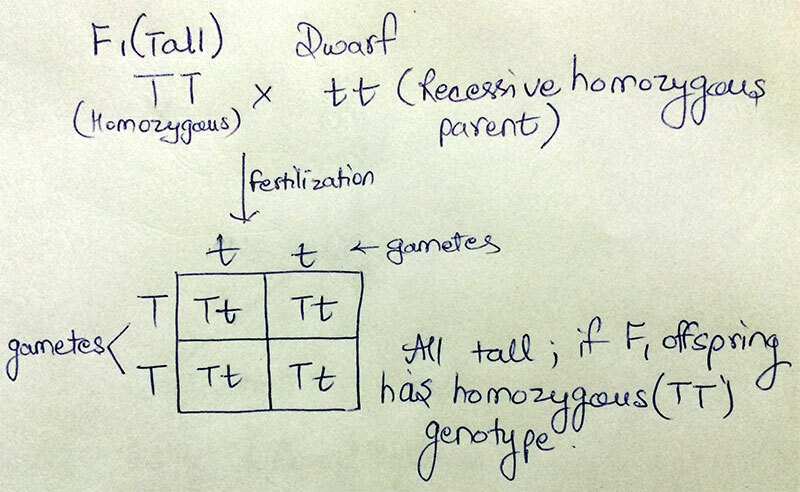 Used to determine genotype of F1 offspring, whether it is homozygous or heterozygous. AIPMT-NEET Biology Aspirants, read out the next AIPMT-NEET Biology Study material/ Notes of Mendel’s Seven Pair of Contrasting Characters, important for AIPMT-NEET Biology. Free online notes for AIPMT-NEET. Hello All AIPMT Biology Aspirants, here is the study material of Genetics. Genetics: It is the science of heredity and variation. Heredity: Transmission of traits from parents to offspring via genetic information. Variation: In biology, the occurrence of differences among individuals. Hey All AIPMT Biology Aspirants, read out the next AIPMT Biology Study material/ Notes of Codominance, useful for AIPMT Biology. Another exception to law of dominance is Co-dominance. Co-dominance arises when a heterozygote (F1 offspring) shows characteristics found in each of the associated homozygotes (parents). F1 offspring resembles both parents. Hey All AIPMT Biology Aspirants, read about MENDEL’s Dihybrid Cross and Law of Independent Assortment in this study material of AIPMT. Monohybrid Cross: Cross between parents that are different only in a single characteristic. Only a single trait is studied in monohybrid cross. The first generation of a cross is the P (parental) generation. Hello All AIPMT Biology Aspirants, next important topic in queue is Mendel’s Success Story.